As I recall, in the report about the 'it's not freezing' it was not exactly clear if the flow they are referring is real flow or convection. - if it's a real flow then this kind of effort is really pointless. - if it's a convection, then it can work. The cold water created by the freezing goes down, to the bottom of the trench and some water at ambient temperature (maybe around 10C degree) comes up instead of it. The stronger the cooling, the stronger is this convection -> fail. If the water on the bottom of the trench can be cooled to 4C degree (check the significance of this temperature of water somewhere!) then the convection stops and the freezing can become effective. Pleased to read you again. Is the water affected by tidal flow? Is it brackish..either would mean a really HARD time to freeze the liquid. 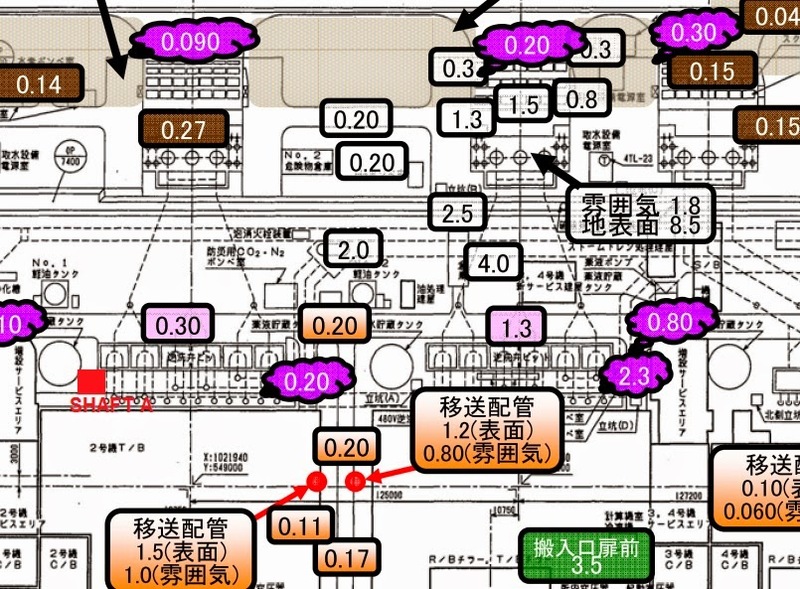 And if water freezes at 5 degrees C as TEPCO says..what is mixed with it to allow that to happen? Is it naive to think that because every radioactive decay generates a little bit of heat, that the water is going to be warmer than if it were not radioactive? Interesting watching the clowns in a circus, pure entertainment. Either the water in the tunnel is flowing like a river or rich in saltwater, maybe both. 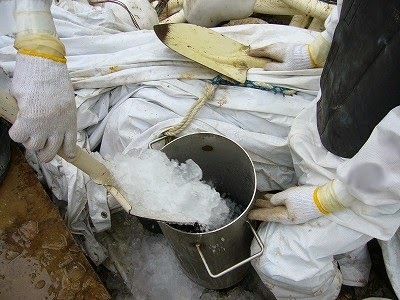 Saltwater requires -2C degrees (28.4F) to freeze. 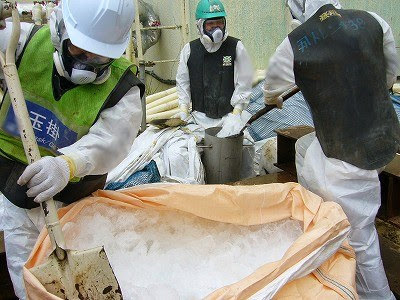 If TEPCO can't even get the top of to ice over then they have bigger problems to deal with. Maybe they should wait for winter to set in. So much for 'cold' shutdown. I cannot read this. Can die while reading of stupid but powerful people doing bad theatre on nuclear dump? 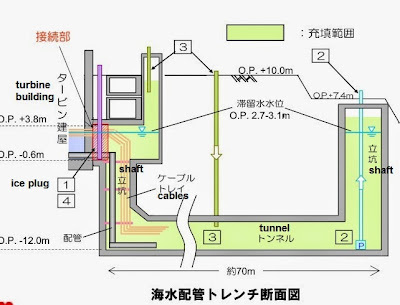 "Either the water in the tunnel is flowing like a river .. "
Did Tepco have groundwater problems before the quake? These guys can't seem to catch a break. "Did Tepco have groundwater problems before the quake? These guys can't seem to catch a break." 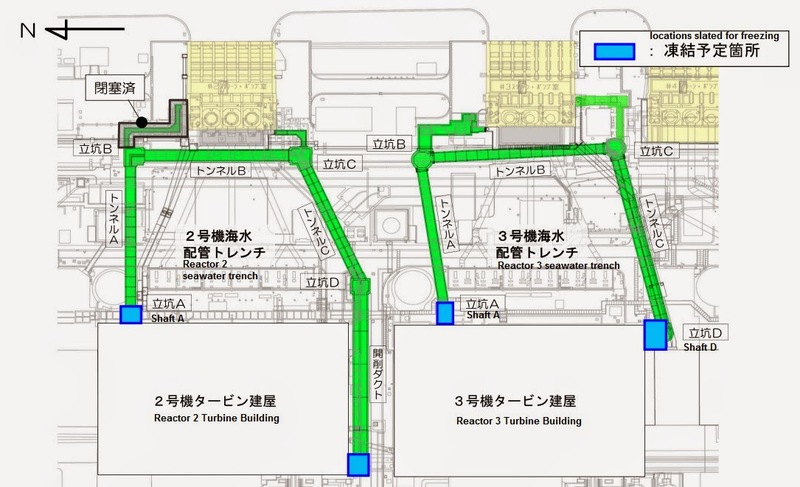 Before the Great Quake, TEPCO had sump pumps to pickup any nuisance water at various spots around the site plus to monitor for radioactive water (leaks). During the Great Quake, ground fissures were opening up on site and knocked over a transmission line nearby thus causing the station blackout. Most of the coastline in that area was subsiding (sinking) about 2 1/2 feet and sliding east 5 feet during the Great Quake. 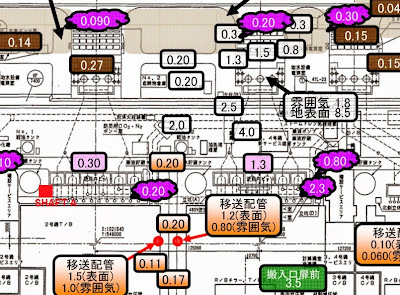 TEPCO caught a break between the time the plant site was being built until the Great Quake struck, then there luck ran out. "...Portions of northeastern Japan shifted by as much as 2.4 m (7.9 ft) closer to North America, making some sections of Japan's landmass wider than before. Those areas of Japan closest to the epicenter experienced the largest shifts. A 400 km (250 mi) stretch of coastline dropped vertically by 0.6 m (2.0 ft), allowing the tsunami to travel farther and faster onto land..."
As pointed on the comments, because water gets its maximum weight at 4 degrees maybe they are trying to fill in first with 4 degree water, from bottom to top, and then move on to lower the temperature below 0. What I dont get, maybe a bit naive, is why they are trying to do it in summer.It is true that rains are not so strong but temperature of water flows, soil and environment does not seem to help... also working in those suits must be hell..
A few weeks ago NHK tv newscaster visited the headquarters in Fukushima and was talking with some of the staff.First time in prime-time, AFAIR. Felt kind of a Tepco infomercial to calm the masses but better than nothing.. 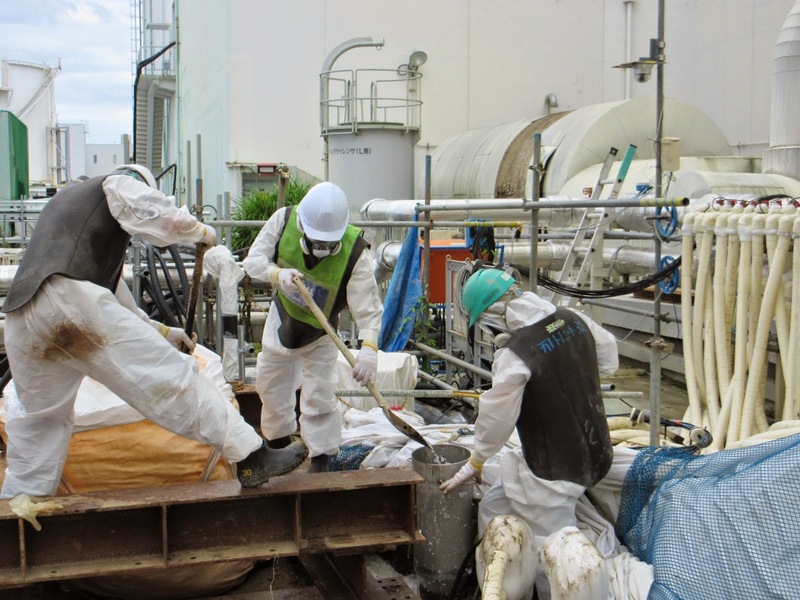 I hope these people get more recognition..
"If TEPCO can't even get the top ..to ice over then they have bigger problems to deal with." They should try partitioning the water with baffles to break its flow as a body. Ha ha ha, "defies (the) laws of physics", there's a good writer there, with a Marx brothers-like sense of humour. In French we would say it just the same : défie les lois de la physique. Lol, Phiphi. 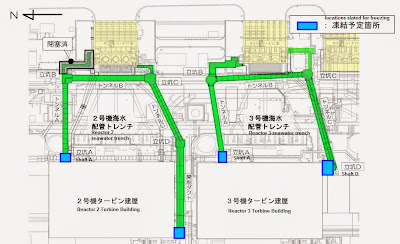 "Nowhere close. .. after 3 months of freezing. Ahhh good (bad) old days are back... when TEPCO used diaper polymers, saw dusts, shredded newspaper .. "
TEPCO must have been using the outlier measures of temperature to get those results these last few years. And those tepcam videos of heat rising above the reactors? There 'ya go .. But actually the real reason is simply that they got the permissions and finished the preparations. So they moved. Uht oh, Obokata's boss offed himself! "As deputy director of Riken’s Center for Developmental Biology, Sasai supervised the work of lead author Haruko Obokata .. "